We’ve asked Dr. Michal Pullman to think about 1968 and Romania which was against the invasion of Czechoslovakia. What did that say about Ceausescu which was against any freedom in Romania and now he was suddenly approving freedom of press, freedom of speech, etc in Czechoslovakia? Do the Czech people remember this and consequently perceive Romania in a different way? “The perception of Romania and Czechoslovakia was also ambivalent in this way; on the other hand Romania was perceived as a country where the communism had the most violent practices. The Securitate was very well known in the whole Eastern block and was referred to as a kind on non-human or was synonymous for non-human approach of the system towards its inhabitants, towards the people. “Of course and the comparison is fantastic on various levels. Primary level is the violence at the very end of the regime whereas the Czechoslovak is closely bound to the ideology of non-violence and brotherhood. The Romania was very violent and this was already at the time a tension that was not too much discussed cause people did not know how to articulate this huge difference but the violence outlook of the 1989 revolutionary upheaval. How can we talk about the Romanian events of December 1989 was really perceived at the moment. There are also other important differences… we can talk about 1989 whereas Romanian revolution began with an idea of religious freedom it was of course reduced freedom was one of the many topics in Czechoslovakia but the most important notion was non-violence not the idea of violence in religious life as was the case in Romania and also there are many other differences in the everyday life. Within the urban layout, the role of city centre is crucial. The distinct central clusters, their spatial configuration are their evolution in different periods of time, offer a meaning to the existing urban structure of the city of Bucharest. 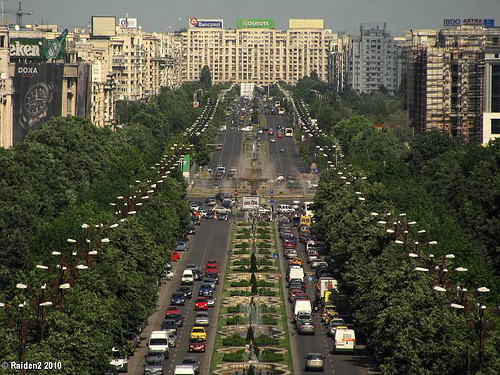 In an organically developed city spatial configuration, the city centre has the crucial role of providing a compulsory basis for the functioning of the city as an economically sustainable centre; However, the socialist modernizations through which Bucharest went through, caused a power relationship between centre and the governmental buildings, where the ideology was the force that overcame space as a generator of social boundaries. 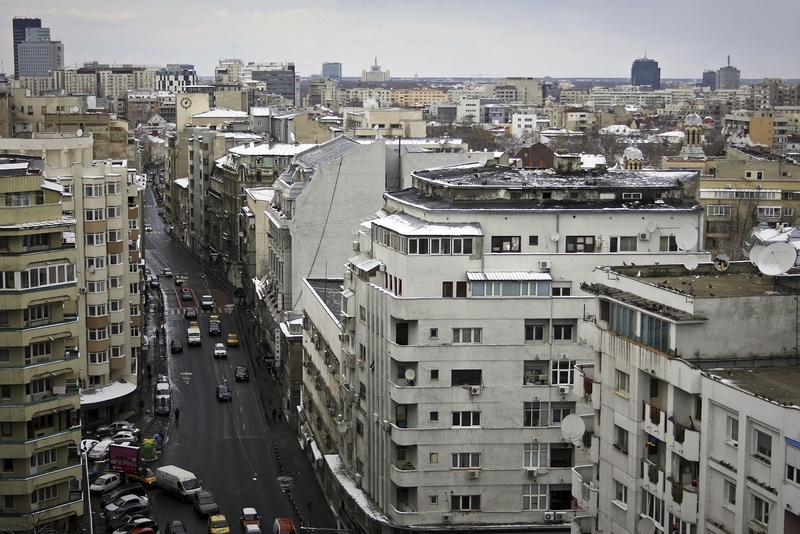 The socialist urbanism had the most significant role in developing the nowadays Bucharest urban layout as the spatial configuration of Bucharest was directed from an instrumental use where social necessity shaped the city, towards a symbolic use where ideology was reflected. Bucharest manages though to portray the character of two environments: the Civic Centre (a district in central Bucharest which was completely rebuilt in the 1980s as part of the scheme of systematization under the dictator Nicolae Ceausescu) and the historic centre (represented by few streets, reminiscent symbols of pre-communist Romania). The tenant blocks of the Civic centre, alongside Ceausescu’s Palace are the most outstanding memories of the socialist era. 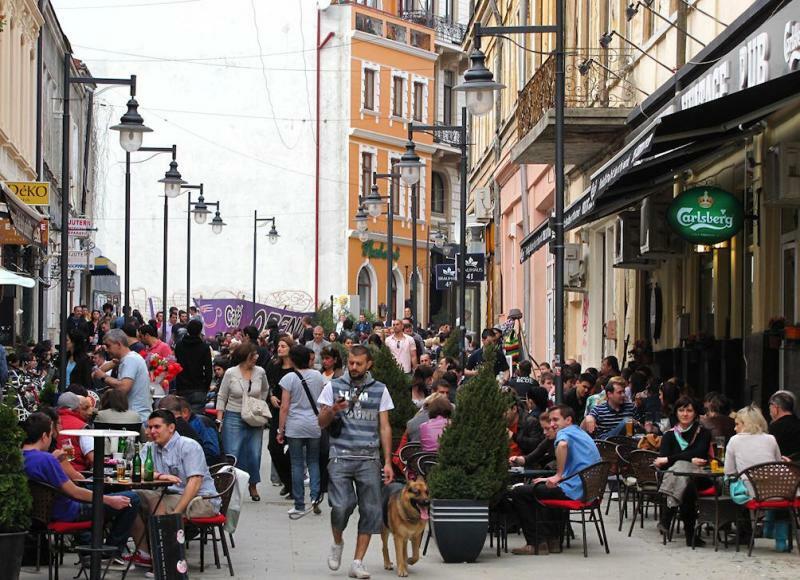 The 3 km long boulevard (Bulevardul Unirii – centrally located) has the function of linking “important destinations” (The People’s House and a car park) by giving structure and comprehension to the city. However, neither the boulevard itself, nor its strategic position encourages participation; people prefer other boulevards for evening walks since this one isn’t going anywhere. On the other side is the remaining historic core of the city which was build on the ruins of the Princely Court (Curtea Veche) and represents an archaeological reservation. 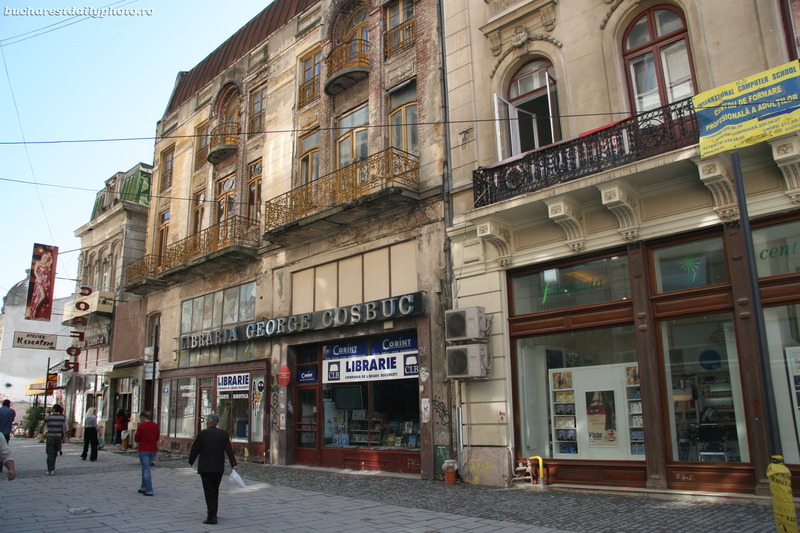 Most of the historic centre’s buildings date from the 19th century and many of them are in a bad condition, but they are significant as they symbolise the country’s survival. The public and the private domains have a close relationship which resonates through the multiplicity of entrances sporadically located between residences, passages, restaurants or shops. There is close communication, people shouting from window to window, recreational areas, and all of these gives the people the feeling of a private yard. 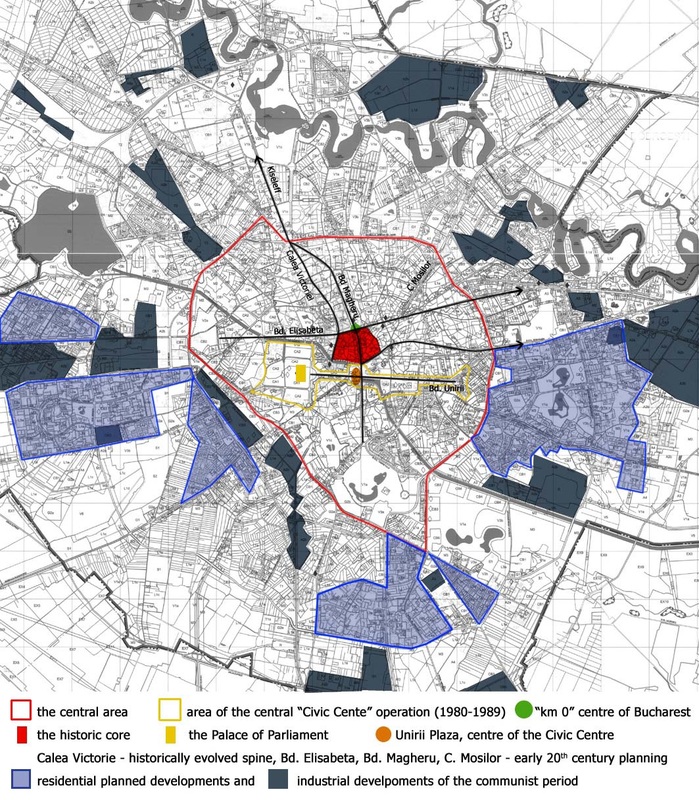 The existing city arrangement of Bucharest can be categorised as a radial-concentric one, maybe even a mono-centric one. For us to understand its urban typology, we’ll have to observe the modifications of the city as a result of the sociological, economical and geographical issues. Also, the symbols of Bucharest, its planning and use of space have been essentially determined by its influences and models. Although the existence of Bucharest was first attested in 1459, its first utilisable map only appeared in 1852. 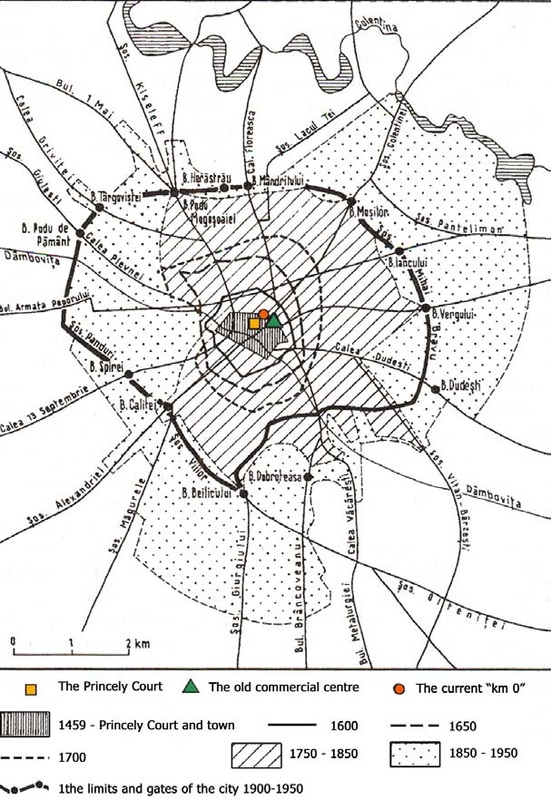 As you can see from the map below, the radial rings prove that the city grew concentrically. Historically, during Carol I’s kingdom, the development of the city changed through the implementation of 60 miles of new roads (1895-1899). These initial operations were finally concluded between the 2 World Wars and the result was of an old city built within the new structures. The city was called “little Paris” as the French influence was clearly observed on all the major boulevards where restaurants, cinemas, theatres and small palaces were easily accessible for a more fulfilling social life. However, between 1945 and 1989, when the communist regime was in power, new ideas had been implemented in the urban structures of city: uniformity, control, centralised economy and density of population. One of the first stages was to centralize the industrial zones, to build on a big scale so that people would feel the power and solidity of the new environment. The constructions from that time are still considered out of scale and out of time. It was during the 1960s that a severe economic and social change happened in Romania and it was perceived initially as a step towards the values of the West. Fundamental during that time was in 1968, when Romania defended the “national” rights of the Warsaw Pact community during Czechoslovakia’s invasion by the Russians. 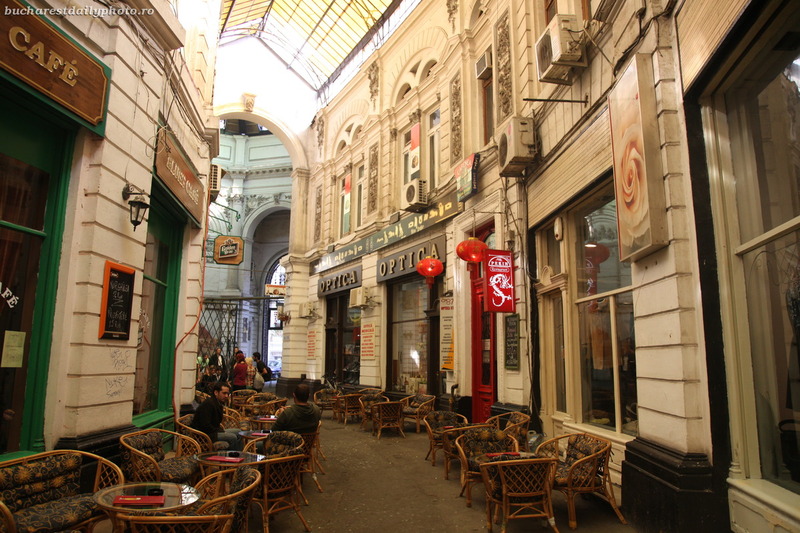 It was in this context that the idea of a new urban Romania was first instilled. The major peasant class was somewhat negating the plans for a liberated industrial country and as such, an upheaval started in most major cities. In Ploiesti, Onesti, Bucharest (among others), lots of new grey concrete flats buildings were suddenly constructed, the Iron Gates dam was built and various other industrial projects emerged. This was all part of a jump to urban industrialism. 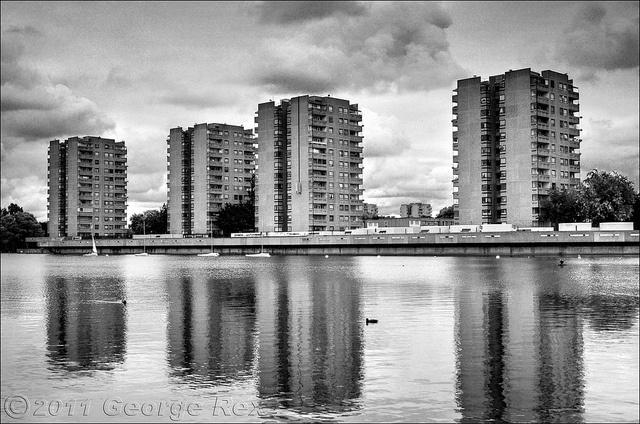 Wherever a new mega-plant was built, enormous blocks of apartments were also raised to house the workers. This whole concept of urban industrialization was inspired by Le Corbusier’s Radiant City idea from the 1930. In brief, the plan was based on the construction of 5 to 13 story blocks of apartments which were divided by “green spaces” and expansive boulevards. 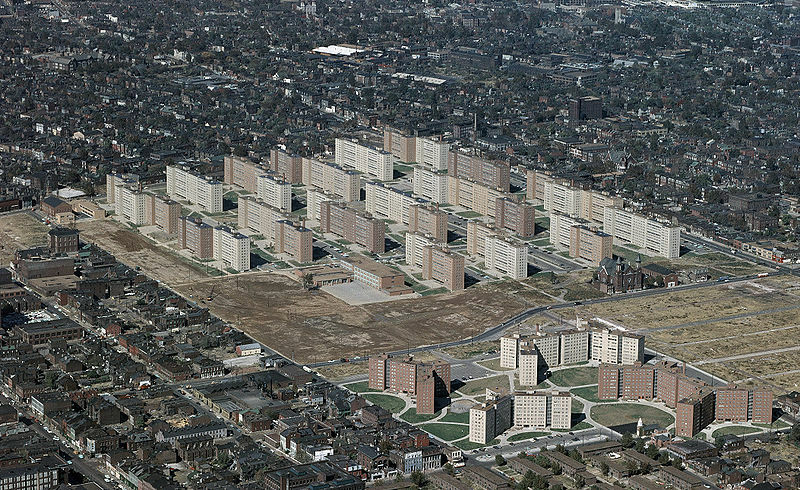 The same ideas were implemented in the USA, where similar housing projects became known as “The Projects”, places that have been transformed over time in racial ghettos (as was Pruitt-Igoe in St. Louis before it was demolished). Nevertheless, Romania’s idealism of a future based on high-rise blocks of flats was widely spread throughout the world and it was partly a result of a world-wide generation of architects and urban planners inspired by the idea of an apartment block where “good life” is enjoyed. That was at the time the international pattern for the “new urban persona”. The problem in Romania was, however, the intensity of this model. As it was apparent from other countries that have tried the same, the long-term benefits of these developments to the social life were to say the least questionable in Romania. The most incapacitating effect was the complete “dehumanization” that these new urban developments imposed on their population. All the citizens’ homes became nothing more than numbers, tagged by a series of anonymous letters and numbers: (i.e. Bucharest, Sector 2, str. 1st May, Entrance B, Floor 6, Apt 39). Shopping was also controlled by the government and it was separated into various buildings where there was no emphasis on the customer’s needs. Basically, everyone had to buy what was offered, although this was rarely what was wanted (i.e. access to fruit, meat, milk and eggs was limited and based on the number of people from the household – you had to prove you have a family if you were to buy more than 3 eggs and so on). By congesting so many people together, the system eliminated any idea of shared responsibility for public spaces. In addition to this, people would be moved around as per the desires of the men in charge. Numerous families were moved from building to building and even from city to city as their homes would be taken away (for more important people). The apartments, even though very cheap to fund, were a tool of political manipulation, as they could have been taken away as randomly as they were given. On top of this, shortly before the communism fell, flats no longer had head in winter; there was scarce access to food, bad public transport and no concern for the individuals. 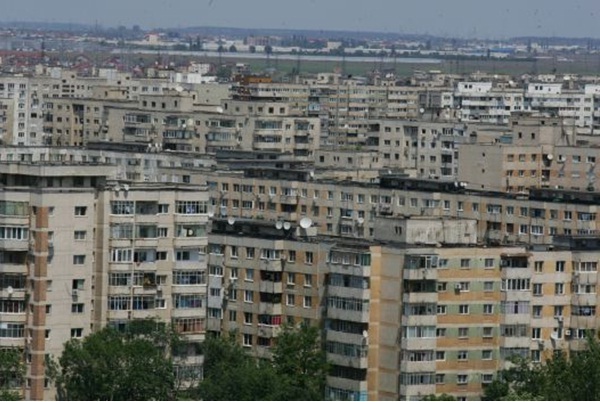 The population was seen as a unit and devilishly, Ceausescu also decided that villages can be bulldozed and then substituted by concrete apartment blocks and this would also urbanize the peasant generation within a short period of time. Although this project was launched, the idea fell through because of his fall from power in late December 1989. It is remarkable that major changes appeared over a relatively short period of time with the operations realised in the 1980’s, when the spatial configuration changed from an instrumental use, to a symbolic use, also confirmed by the location of different activities in relation to integration patterns. 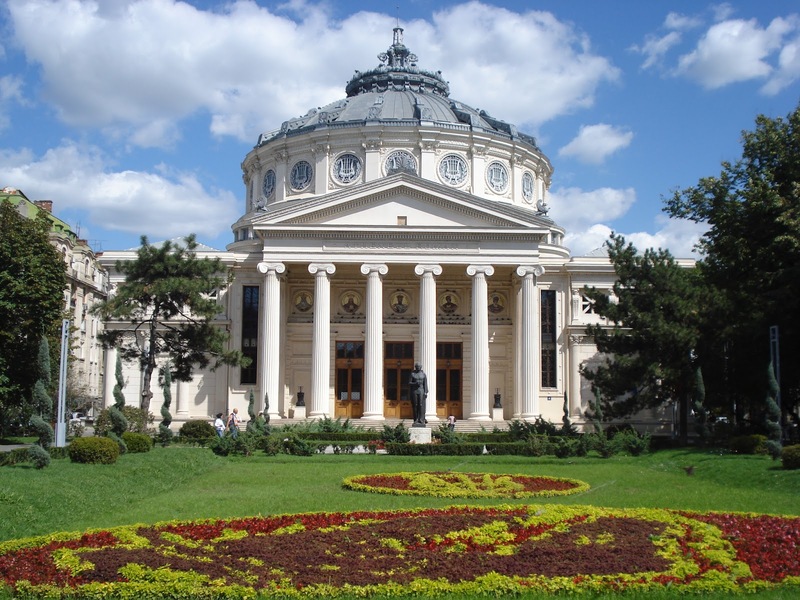 The Romanian Athenaeum is one of the few pre-communism symbolic buildings of Bucharest which wasn’t modified or demolished during the communist era. The building is inspired by ancient Greek temples and it was designed by the French architect Albert Galleron under the scientific research and guidance of Alexandru Odobescu, revised and supplemented by the Romanian specialists Al. Orăscu, Ion Mincu, Ion Socolescu, Grigore Cerkez, Cucu Starostescu. The circular building made use of the existing foundations of the Grădina Episcopiei which were initially meant to serve as a foundation for the construction of a circus. Downstairs, the impressive marble lobby incorporates 12 Doric columns which support the concert hall. Connecting with the audience and the anexes (offices, rehearsal rooms, cabins for soloists and conductor and so on), there are four monumental spiral staircase of Carrara marble (Baroque type), carried by intermediate floor balconies. 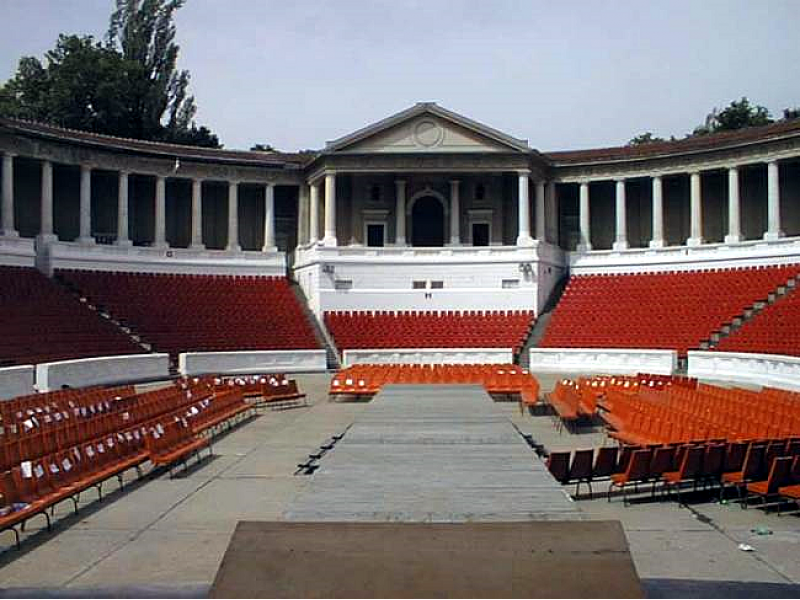 Arranged in the form of an old Greco-Roman amphitheatre, the nearly 1,000 seats (three areas downstairs and two circular rows with 52 boxes in the middle with a central lodge) offer a perfect view from any corner and a perfect audition. The sound perfection is due to the huge domes (richly decorated) which “absorb” the instrumental and vocal background of the podium, in order to distribute the reverberation to the auditors, with the full range of harmonics up to the finest timbre and tone colour. 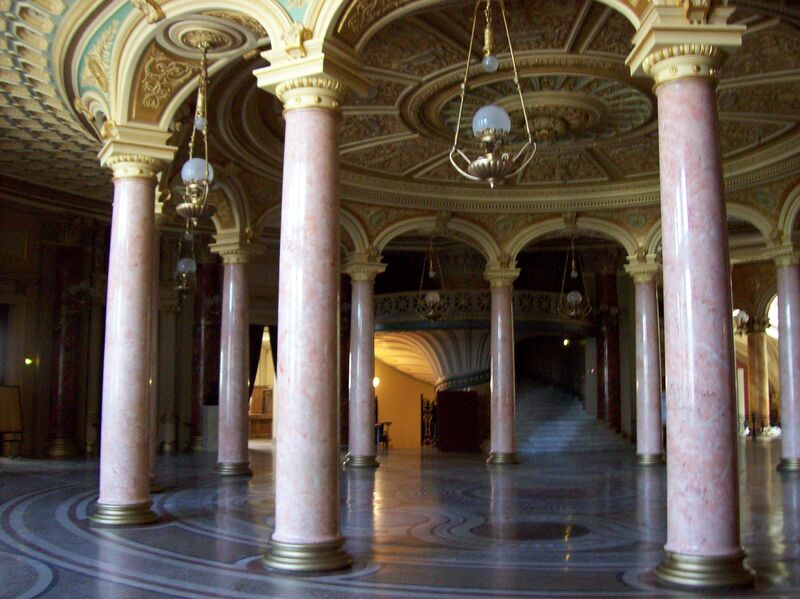 It seems that the exceptional acoustic cavity of the Romanian Athenaeum Hall places the building among the most successful constructions of this kind not only in Europe but worldwide. Its global reputation and significance for Romanians have not gone unnoticed with Ceausescu who decided not to interfere with this marvellous building. 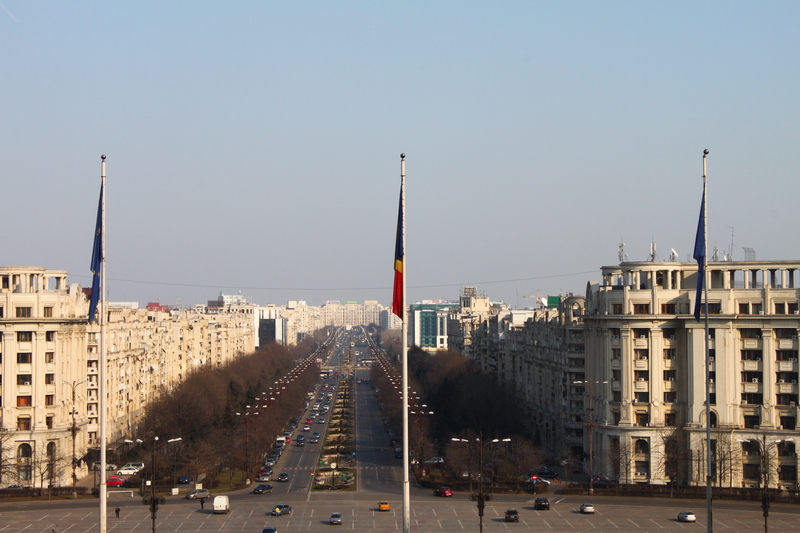 During its entire existence in Romania, the communist regime was able to see its political message perhaps the best expressed in the architectural planning of Bucharest. Architecture, seen as a science that designs buildings, both residential, as well as the institutional, could (as could any other scientific or cultural field) not have another faith than the one subordinated to the communist totalitarian system, which was a perfect mindset defined by the Orwellian formula of “double language” – meaning the difference between the official discourse and the real one. A second aspect of communist beliefs included the institutional buildings constructed in a megalomaniac way – specific to the totalitarian regimes, serve as an expression of prosperity and welfare of the state. Finally, one last way to put in practice the Communist totalitarian ideas was the destruction of monuments of historical value which served as memorial places for people, in order to erase the memory of a previous period regime off their minds. Bucharest wasn’t literally torn down, but it was destroyed. All the communist tenant blocks that were constructed during that time destroyed the air and elegance of “The little Paris”. 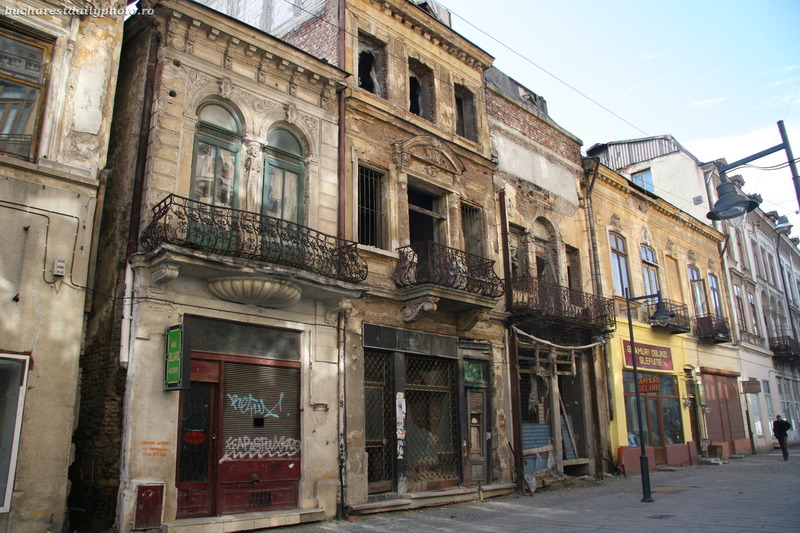 Those constructions are connected to The Futurists Manifesto, as the tenant blocks were constructed in order to provide equality among the romanians, but they also provided lack of individuality and Romanians had to forget who they used to be. What do you think was good about communism? Maybe the fact that the kids with poor families benefited from free camps and that the kindergarten taxes were cheap. You were able to give your children an education without being wealthy. What was bad about communism? What I hated the most during the communist era was the lack of privacy and the in-existent access to information. Me and my husband used to lock up in the kitchen in order to listen to “Free Europe”, a radio station with international news which was forbidden during communism. We would do the same to listen to rock music which we enjoyed, but was really hard to find. My husband used to invite his friends over, and listen together to those foreign radio stations, even though they weren’t allowed to do that. We lived in a building with lots of flats where all the other owners were working for the security, so we had to be very careful each time we were doing that. When it comes to food, I don’t even want to remember how much time I spent waiting in queues in order to buy some. At one point, they introduced queue tickets. But you couldn’t find food any-more People would do anything for food; they were capable of anything because they had to eat and there was nothing at the markets. Besides that, we didn’t have heating in our homes. Me and my husband had our first kid in the ‘80s when we didn’t even had any heat in the apartment, so we got hold of a diesel oil heater. We used to steal fuel every day from our workplaces in order to heat up the baby’s room, but it was very risky because we could start a fire in the building and everyone would have been in danger, so we had to be very careful who sees us when coming back from work. It was a time when they wouldn’t allow curtains in restaurants. All the restaurant owners were instructed to take off all the curtains as they had to be aware if there was someone drinking alcohol early during the day or late during the night. The communist party’s observers had to watch closely people coming in restaurants and interrogate the ones choosing to drink alcohol. Because Ceausescu’s wife, Elena, hated how churches looked, many were either demolished, moved away or surrounded by blocks of flats. People didn’t have to believe in God, but in Ceausescu and communism. If you wanted to buy yourself a book, you were obliged to buy another 5,6 books with Ceausescu’s discourses. Ceausescu’s portrait was on each first page of the textbooks. You weren’t allowed to destroy that page or draw/write on it. Also, every classroom had a painting with Ceausescu. When watching television, all we could see were communist films. They would start broadcasting at 6,7 in the evening with a cartoon programme and afterwards start the news which lasted 2 hours, until 10 o’clock when they also switched off the electricity. All the news were about Ceausescu and his discourses, walks, controls. And all of these were lies. We had to watch all the time on the news, Ceausescu “having fun” while hunting. His results were always remarkable for the camera, even though the boars were bounded in order to stay still. We all knew this, but we used to find it funny, especially because we found out that Ceausescu always had someone else shooting in the same time with him to be sure he was successful. His visits to various workplaces (refineries, industrial warehouses, etc.) were also lies, as we were all rehearsing everything before his arrival. I remember that it was very annoying when he was coming in control because we would work full weeks in order to clean and re-paint the place, to write down messages and to create expositions with everything that we had in the enterprise. I remember that one time he visited an apple orchard. The president of the co-operative declared that he had the biggest production of apples in the orchard’s history and when Ceausescu decided to control it, he asked his employees to tie apples in the trees, so the first 3 rows of trees would have lots of apples. And this was not a one-of-a-kind situation. The farms did the same as cows, pigs, sheeps were moved from a place to another depending on Ceausescu’s controls. How do you think communism affected Romania? I definitely think that Romania would have been better now if it wasn’t for the communist era. 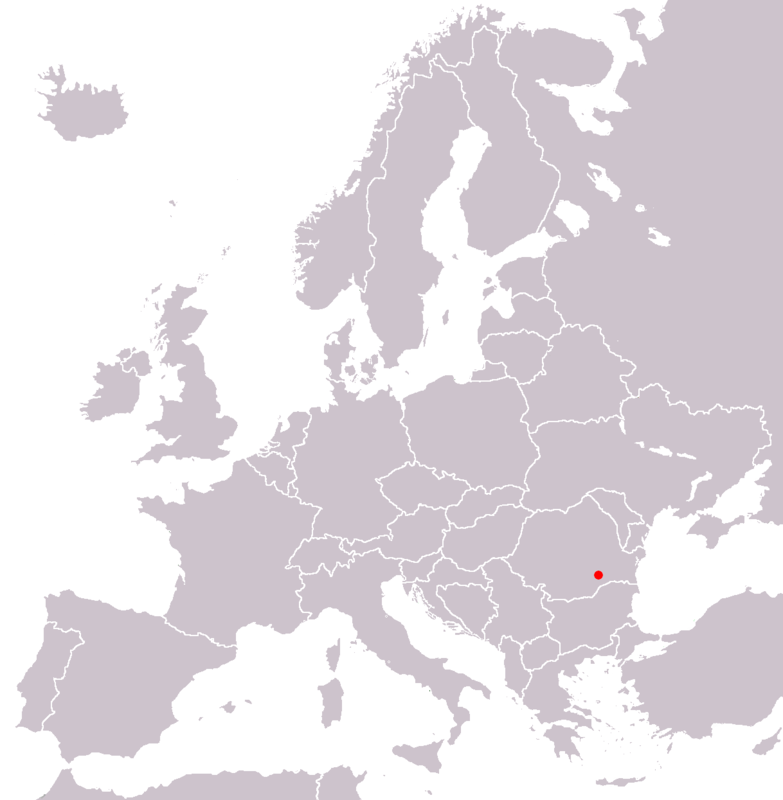 In the inter-war period, Romania was well rated by Europe because it was much evolved culturally and industrially. We would have been a very rich nation. My grandmother used to tell me that before the communist era, everyone in the country had a house and all kinds of animals, so they didn’t feel the need for food. The entire surplus was going to the citizens which were able to buy everything they wanted to. Romania used to be known as “Europe’s granary” during that time. We had petroleum, salt, iron, ore, coal. Also, the relief favoured us: rivers, mountains, fields, seaside so the Romanians had everything they needed for a living. The industry was very developed and people used to live well. In the inter-war period, Bucharest (Romania’s capital) was known as “The little Paris” of the Balkans, because the wealthy people of the city constructed for themselves really nice houses. The communists said that they are going to modernise it, but actually, they destroyed it. Ceausescu demolished everything they built, and constructed lots of grey block of flats, which we called “boxes of matches”. Many of the rich people from the pre-communist era were obliged to move out of their house for various reasons (“enemy of the state”, “traitor” and so on). Because of this, entire families lost their homes, their possessions and it led to exasperation and even to suicide. There were many people who killed themselves because they lost their houses. Ceausescu’s strategy was to put all the people at the same level in order to control them. People would have little to no freedom in a building full of flats as most of the neighbours actually worked for the police and if someone would do anything out of the ordinary, he would be classed as “a threat” for the party and he would end up really bad. I met a family which used to be very wealthy, but because the communists took everything they had, they ended up living in a basement. The woman, Florence still had her old dresses and she used to wear them and talk by herself on the street. Her husband was one of the few still wearing hats and tailcoats – from aristocracy they became the laughing stock of everyone else. She ended up getting a job as a “shopper” for anyone willing to give her a few coins. She would wait in long queues for hours to get someone else’s food and she ended up carrying lots of bags everywhere she went. That’s how we started sarcastically to compare ourselves with Florence every time we had more than 3 or 4 bags in our hands.